Will the warmer than normal winter last across India? 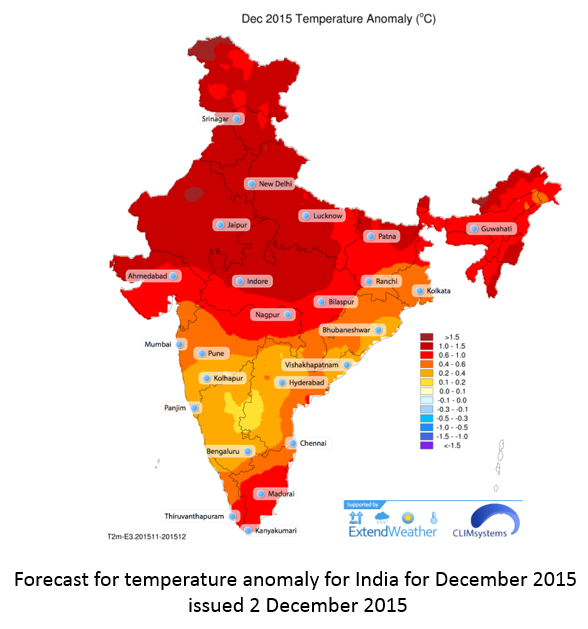 India experienced the hottest December in last 114 years in 2015. The mean temperature in December was above normal by 1.2 degrees Celsius, the highest ever recorded rise for this month. And the forecast from Extendweather for the month of December predicted this warming trend (image). The above normal temperature spell is expected to push through January for most but not all with areas to the east of Lucknow and down to Kolkata and across to the Northeast being only slightly warmer than normal. Cities to the west and south like Delhi, Chandigarh and Kanpur have been reporting unusually high temperatures for the winter months and should continue to do so for January but should be closer to normal in February. Wheat production in India (being the world’s second largest producer) could drop for the second consecutive year due to unusually dry and warm winter although some winter rains are occurring in January they are less likely in February. Warm weather also had an impact on winter- wear sales which can impact on retailers. Food security concerns can emerge as the current ENSO event does not look likely to return to neutral conditions until July or August of this year. Forecasts for February and March rainfall and precipitation can be viewed by clicking here. Sign up for a trial to receive additional months of seasonal forecasts for India.